Product prices and availability are accurate as of 2019-04-15 09:45:12 BST and are subject to change. Any price and availability information displayed on http://www.amazon.co.uk/ at the time of purchase will apply to the purchase of this product. Distillery HistoryBuilt in the centre of Oban as a brewery by town founders John and Hugh Stevenson. Distilling begins 1794. Rebuilt 1890-94 by J. Walter Higgin (Mesolithic remains discovered). Occupys a unique but small town centre site that prevents expansion. Closure announced 1968 but reprieved 1972. One of Scotland's smallest distilleriesJust two small lantern-shaped stills. Slow-condensed in traditional worm tubs that nestle in the rooftops. Cramped conditions led to unusually short lyne arms. Food PairingRich sweetness with a smoky dryness; ideal with rich tastes, buttered tagliatelle with Parmigiano Reggiano, Italian peppered sausages, black pudding, haggis, spaghetti with Bolognese sauce, steak and kidney pudding. AppearanceAmber. Rose-hued.NoseOutstanding. 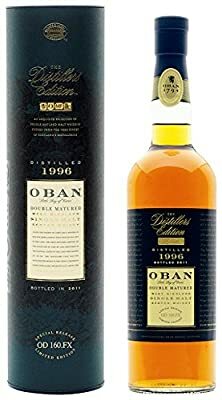 Fruity and pungent; Oban's salty sea breezes, with crushed grapes, orange zest and hints of smoke - massively complex.BodyFull, rich.PalateMost explosive Oban ever. Soft malt, then wave upon wave of delicate yet rich fruit notes on a tide of brine. FinishSweetened Jamaican coffee and oak, with an attractive malt-biscuit effect as it dies down.